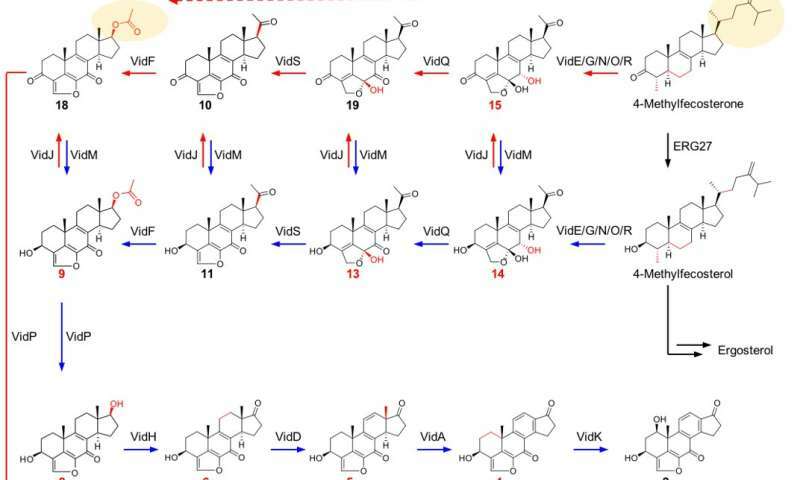 A group of researchers from Graduate School of Pharmaceutical Sciences at The University of Tokyo and Institute of Traditional Chinese Medicine and Natural Products at Jinan University, identified the biosynthetic gene cluster for the furanosteroid demethoxyviridin, and deciphered its biosynthetic pathway. To identify the biosynthetic gene cluster of demethoxyviridin, the research group sequenced the whole genome of Nodulisporium sp. (a symbiotic fungus which produces demethoxyviridin), and identified a total of 103 cytochrome P450 monooxygenase genes in the genome. The CYP gene clusters in the genome could be potential targets, since demethoxyviridin possesses a highly oxygenated structure. Analyses of the relative localizations of these genes in the genome revealed twelve CYP clusters containing two or more CYP genes. To determine the candidate gene cluster of demethoxyviridin, one CYP gene from each gene cluster was randomly selected and its expression was analyzed by reverse transcription PCR, under demethoxyviridin productive and non-productive conditions. As a result of CRISPR-Cas9-based gene disruption of the candidate genes, the group identified the gene cluster for demethoxyviridin production in this symbiotic fungus. Successive analyses by using Aspergillus oryzae heterologous gene expression system, and an in vitro enzymatic assay further confirmed each of the biosynthetic step and yielded the fourteen biosynthetic intermediates. Structure-activity analyses of the intermediates revealed that the 3-keto group, the C1β-OH, and the aromatic ring C are important for PI3K inhibition. In addition, the in vitro studies revealed that the pregnane side-chain cleavage notably requires three enzymes, flavin-dependent Baeyer-Villiger monooxygenase, esterase, and dehydrogenase, in sharp contrast to the single CYP-mediated process in mammalian cells. Through extensive bioinformatic analyses, we revealed that these pregnane side-chain cleavage pathway is widely distributed in fungal genomes, and a conserved sterol metabolic pathway in the fungal kingdom.